#8 x 1/2 in. 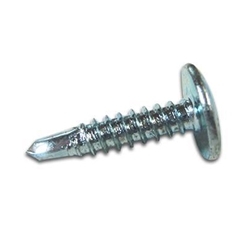 Zinc-Plated Steel Truss screws securely fasten 20 - 12-gauge metal in stucco/plaster and other metal-to-metal fastening applications without needing to pre-drill. The screws feature engineered drill points and flutes that remove material efficiently and properly size the hole for threads.